The Texas Redbud is a multi or single trunk small tree with thicker, smaller, glossier leaves than the Eastern Redbud and the flower is more intensely pink in color. 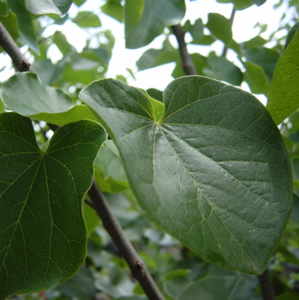 The Texas Redbud is drought and heat tolerant and can tolerate insects and alkaline soil better in Texas than the species can . Cercis canadensis subsp. texensis is a Texas Native and is commonly seen planted in the “Hill Country” area of Texas. This Redbud can reach 25′ at maturity.